I’m big on mermaids these days. I’m not sure if it’s a trend, or if it’s because my two-year-old niece Abigail has thing for Disney’s The Little Mermaid, or if it’s because I want mermaid hair…but whatever it is, I like it. Mermaids are turquoise. Mermaids are swirly. Mermaids are sequined. In other words: what is there not to like? I decided my house is far to pink and orange. I want some swirling turquoise flair. I want some mermaid….and now I have it. Shazam! 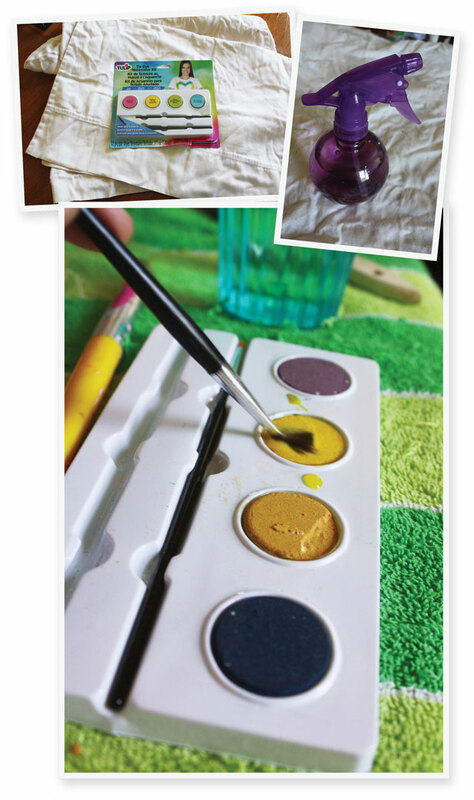 If you have ever worked with tie dye before and liked the resulst but found the process messy or difficult to control, this kit is for you. It’s just the same as using a box set of watercolor paint except it’s fabric-safe. 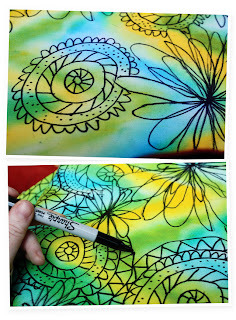 Just dip your brush in water, rub it around on the paint pot, and brush it over the fabric.If the color is too bright, just spray with water and watch the color run. I stared with a basic chevron pattern as a base because I like the contrast between layers of geometric color and swirly, flowery black patterns on top. Alternatively, I could have drawn with the a marker first, then filled in the lines like a coloring book. Oh well, next time. I was in the mood for doodling this time. Then again, when am I not in the mood to doodle? The end result was a little psychedelic looking. Not that psychedelic is a bad thing, but you know, this is my house. I want it to look like Under the Sea, not a Phish concert. So I tempered it by trimming the pillow with black and white stripe fabric. Cool beans, huh? Thank you to Tulip/iLovetoCreate for sponsoring this post. or follow them on Twitter, Facebook and Pinterest. I have 2 questions. I was asked already, but where did you get the watercolor fabric paint?? and the other question is …..how do you make permanent marker safe to wash?? If you get a chance please contact me at contactanastasia@yahoo.com. ….Thanks!! !